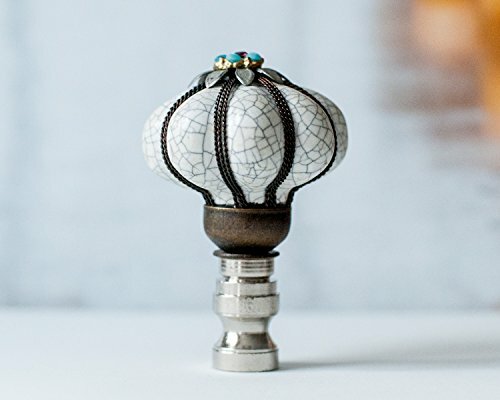 This beautiful finial is the perfect enhancement ornament to fasten to your lampshades. It does not matter if you are looking for something fun and funky or something classic and simple; our handmade superior finials are the perfect accessory for any lamp and will dazzle the entire perception experience and raise it to a new level. With colors that are achromatic, blazing, bright, brilliant, complementing, contrasting, cool, deep, delicate, glistening, glittering, glossy, glowing and luminous, every visual experience with please the senses and impress. Our custom handmade finials create a unique lamp shade. It will surprise you how much a perfect finial will add value to your lamp. We offer porcelain finials, crystal finials, copper finials, resin, and metal finials for every decorating style. If you have any questions about this product by Blessing Light, contact us by completing and submitting the form below. If you are looking for a specif part number, please include it with your message.